Stations: Goulburn Academy, Parramatta G.D’s, Granville, Ermington, C.I. Duties – Granville, Castle Hill, Task Force Boyne, Ermington, Rosehill, Special Crime, Internal Affairs, Hawkesbury L.A.C. 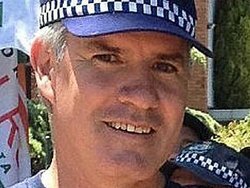 Two people have been arrested after a senior police officer died after sustaining critical injuries in an axe attack in Sydney’s north-west. Police say Detective Inspector Bryson Anderson was among a number of officers called to a dispute between neighbours at Scheyville Road in Oakville about 2pm (AEDT). About two hours later, Detective Inspector Anderson was seriously injured in what is understood to have been an axe attack. After treatment by paramedics he was rushed to Windsor Hospital in a critical condition but died a short time later. Police Commissioner Andrew Scipione said a 19-year-old man and a 42-year-old woman had been arrested at the scene and taken to Windsor Police Station where they were assisting investigators with their inquiries. 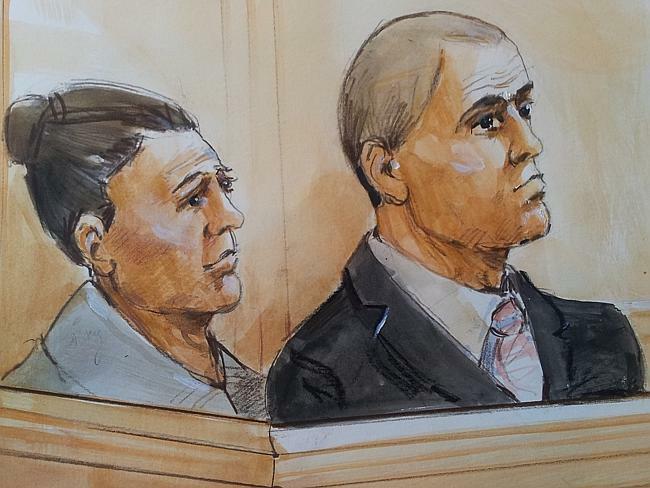 Mr Scipione said Detective Inspector Anderson was from a police family and had left a wife and three children. “They are, as you imagine, distraught, but taking strong support from not only their immediate family, but the police family. “We will console officers that were part of this particular operation. “They, as you would also imagine, are traumatised and all support services have been put around them. Photo: Police say the officer was called to a dispute between neighbours in Oakville. 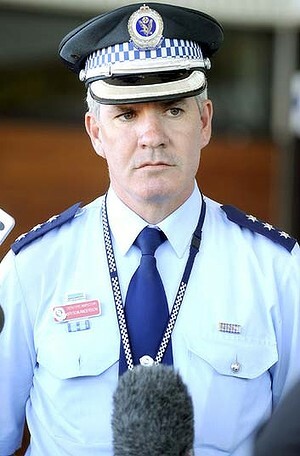 Mr Scipione said he could not provide too many details of the events leading up to the attack given the investigation was in its early stages. “I understand the (neighbourhood) dispute did involve the use of some weapons, but again having said that, we want to get to the bottom of this investigation before we start making too many statements,” he said. “Suffice to say it was a violent neighbourhood incident that caused the police to attend and there were many police there. “Some time after they first attended, there was an interaction which led to the death of Inspector Anderson. 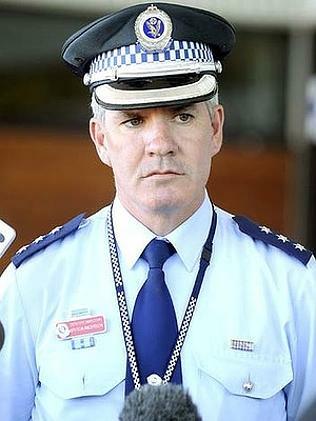 Mr Scipione said Detective Inspector Anderson had worked for him more than 10 years ago and paid tribute to his skills as an investigator. “He was nothing short of a role model to those officers that come after him,” he said. “Today is a stark reminder how dangerous this job is. These people do this in such a way they put their lives before the lives of others. Anyone with information about the incident are being asked to call Crime Stoppers on 1800 333 000 or use the Crime Stoppers website. Today ( Wednesday 12 December 2012) we honour a brave man. Bryson Anderson. A police officer, and so much more. A man who was so deeply respected by the community in which he lived, worked and devoted much of his spare time. A true man of the people. His service to the community was far greater than simply those days when he wore that blue uniform with such pride and distinction. And of course, Bryson was a loving husband, father and brother to his own family. To this family we owe so much. A debt of gratitude for the support you gave Bryson as he went about his duties. Police officers understand that each day they go to work, they put their lives on the line. This tragedy reminds us all of the sacrifice that goes with that understanding. Our community will always rely on men and women of courage who are willing to put up their hands to serve and protect. Bryson Anderson stood tall in their ranks. 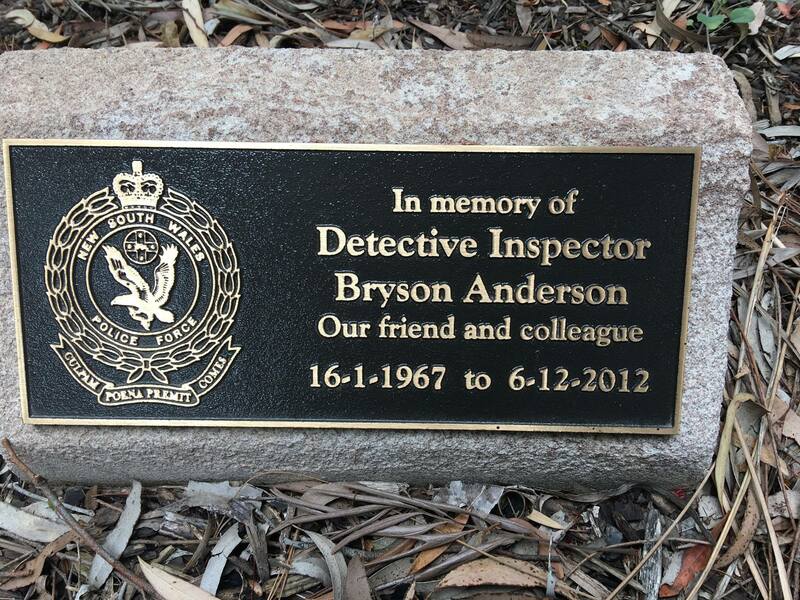 Detective Inspector Bryson Anderson, friend, you have left us with an enduring legacy, a standard to which we can all aspire and for which we are forever grateful. You will always be remembered. 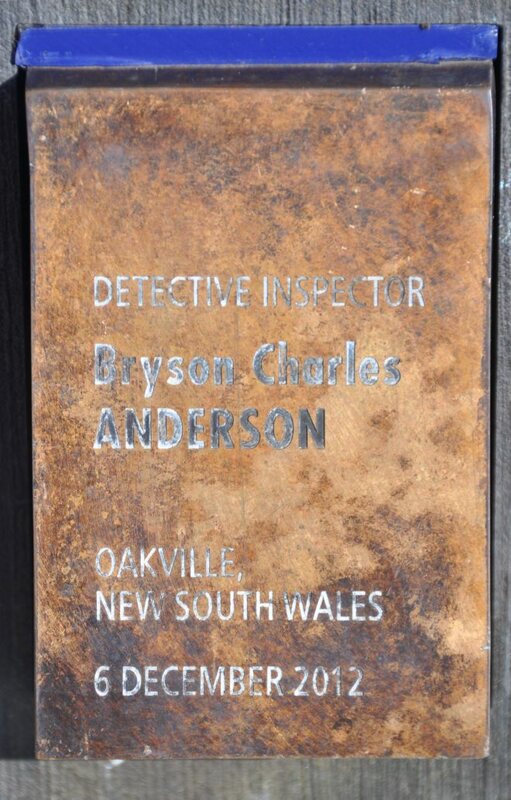 At 3.30pm on the 6th of December 2012, Detective Inspector Bryson Charles Anderson arrived at the scene of a neighbourhood dispute at Oakville near Windsor that had escalated beyond all reason. He went to lend support to fellow officers who were seeking to bring matters to a peaceful resolution. The approach of police was resisted and Detective Inspector Anderson was fatally wounded. 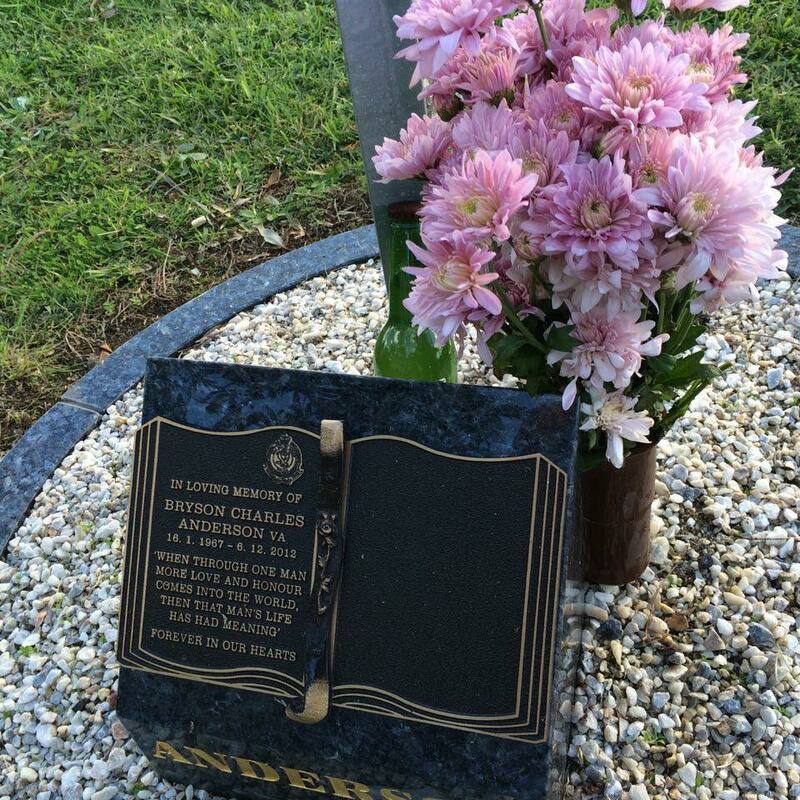 Detective Inspector Anderson was rushed by ambulance to Hawkesbury Hospital but died as a result of his injuries. 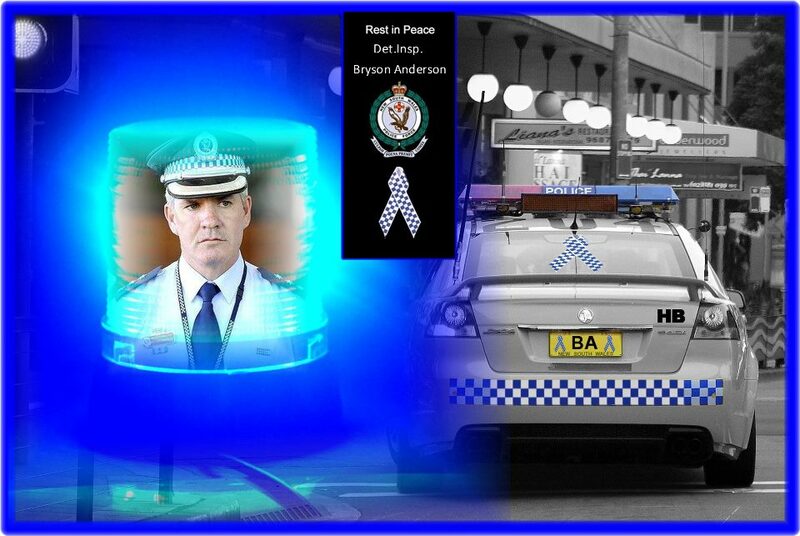 Bryson Charles Anderson began his career as a trainee police officer on the 18th of August 1986 and attested on the 7th of November 1986. His first general duties posting was here in Parramatta. That was followed by others to Granville and Ermington. While at Granville in 1991, Constable First Class Anderson commenced criminal investigation duties, successfully gaining his designation as a Detective in November 1993. Bryson’s designation was a defining moment in his policing career and he quickly displayed an aptitude and an enthusiasm for criminal investigation that was soon recognised by his commanding officers. 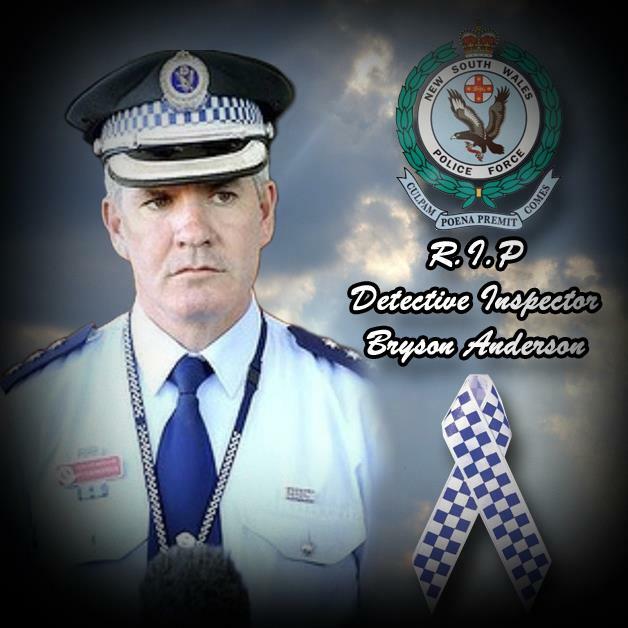 At Castle Hill, Task Force Boyne, Ermington, Rosehill and then within Special Crime and Internal Affairs, Bryson honed his detective skills. He was dedicated, analytical and meticulous. A thoroughly good bloke. I worked with Bryson … and I can vouch for that. In 2004, promoted to sergeant, Bryson returned to general duties. This time it was to Hawkesbury Local Area Command, where he was to spend three years as a supervisor. In 2007 criminal investigation was again to beckon, Bryson seizing the opportunity to return to Special Crime and Internal Affairs … now known as Professional Standards … where he applied his skills to covert investigations. There he was promoted to the rank of Detective Inspector in 2009. What was to prove Bryson’s final posting was back in Hawkesbury. He took up the role of Duty Officer in Hawkesbury Local Area Command on the 19th of December 2010, and served with distinction in that role until the moment of his passing. Throughout his service Detective Inspector Anderson undertook extensive internal training in his chosen policing specialisation. He was awarded the NSW Police Medal; the National Medal; as well as the first and second clasps to the NSW Police Medal. In 2003 he received a Commissioner’s Unit Citation for highly professional investigations. 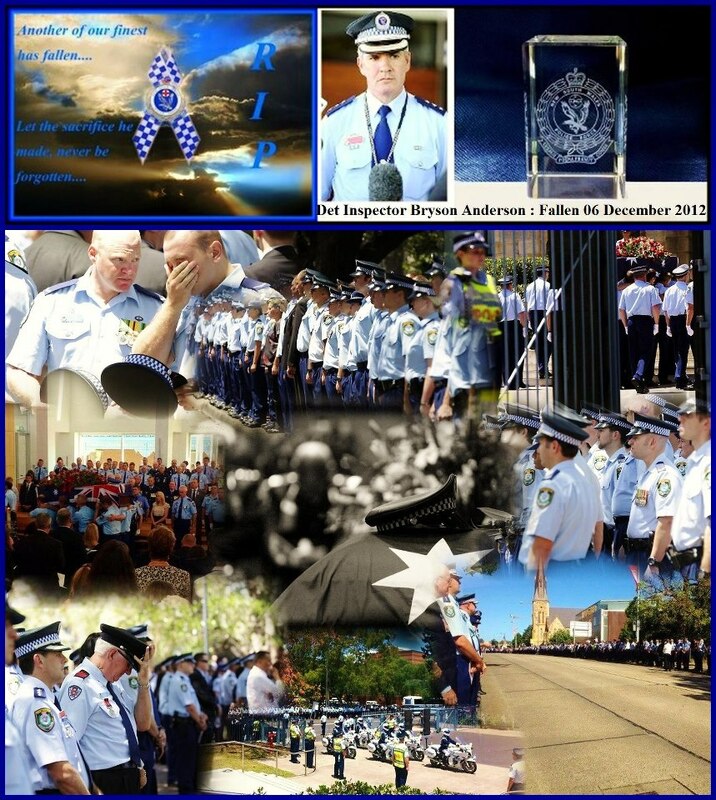 He will posthumously receive the first clasp to the National Medal and the third clasp to the NSW Police Medal. Impressive as they are, the bare facts I have recounted do Detective Inspector Bryson Anderson little justice. Those who knew him … know that Bryson the man transcended … in achievements and in potential … any chronology of this type. Those that know it best of all are Bryson’s wife, Donna, and his three children, Olivia, Darcy and Cain. It is with them that Bryson, devoted husband and father, was closest. And it is they who, tragically, must now manage without his love, strength and support. Bryson’s father, Rex; mother, Shirley; and brothers Warwick and Damian also know the calibre of the man. Bryson’s is a profound loss, but be assured his life was just as profound a credit to you. 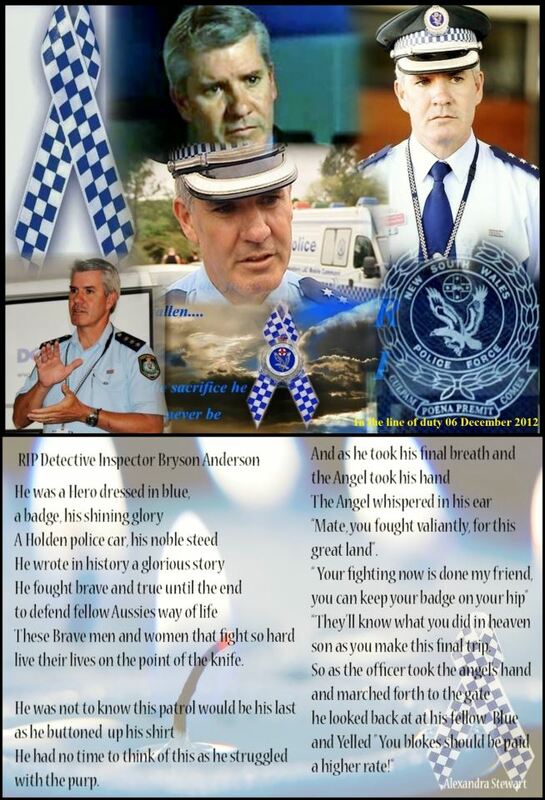 I know for certain that he enriched the lives of all of us in the NSW Police Force who had the good fortune to know him. What the record does not disclose is Bryson’s wholehearted embrace of community service. Even when on holiday, Bryson was thinking of what he could do for others. On packing his bags last year for Vanuatu, in with the board shorts and sunscreen he found room for gifts and sporting equipment for the local village kids. The demands of policing are great: more than enough for most of us, and often more than a full-time job. But not for Bryson. He was retained as a fire-fighter, serving for eight years between 1994 and 2002 at Number 81 Station, Windsor, rising to the rank of Deputy Captain. And it didn’t stop there. Bryson coached a number of junior soccer teams for the Colo Soccer Club. And on the day before he died he took part in the final leg of the Law Enforcement Torch Run for Special Olympics, held in Windsor, an event which five months earlier he volunteered to organise. Bryson loved the Hawkesbury area, where he lived and worked most of his adult life. And innumerable people, from the Hawkesbury and elsewhere, loved and admired Bryson in return. His personnel file is full to overflowing with complimentary remarks and letters of appreciation, many from the community and victims of crime, moved to write in gratitude for the care, dedication and professionalism with which he went about his work. In Vanuatu, upon hearing of his passing, the villagers whose lives Bryson had so selflessly touched while on holiday held a service in his memory. He was equally admired by his fellow police officers, myself among them. On the one hand, a tenacious and committed police officer, driven to pursue offenders for the darkest and most serious of crimes. Yet retaining the most extraordinary empathy, compassion and concern for the victims of those crimes. He showed initiative and leadership; intelligence and perseverance; dedication and humility; and, memorably, a ready smile and an engaging way. Bryson drew people to him, without guile and without effort. The workplace was a better place for him being there. The tributes from his fellow officers were immediate and many. They tell variously of a proud husband and father, a keen motor cyclist, an active participant in sporting clubs, and, invariably, of a superb police officer. He made his vast store of policing wisdom available to young officers but never imposed it. More likely were those officers to hear from Bryson an encouraging “Just play your natural game, it’s first class” – one of his favourite sayings – to go with some tip or insight he’d somehow manage to convey. There can be no doubt Bryson will be missed. He lived for the community, died serving it and deserved much better. His death reminds us that law and order are not givens. They come at a price and that price, on occasion, is a prohibitive one. With Bryson’s death we realise, suddenly, even if belatedly, that ours is a society worth defending. We realise that our hard won freedoms and protections are vulnerable and easily demolished. We realise that not only is each individual’s life precious and fragile … but that so too is our way of life. We meet Bryson’s death with grief and tears, but that can’t be allowed to suffice. If he could lend us his voice, I’m sure Bryson would agree that now is not the time to be timid or defensive. It is not a time to be apologetic, nor a time for retreat. The anger and regret we all feel – for Bryson’s sake and for the sake of all of the officers who have fallen before him – need to find constructive expression. As a society we need to rise up to repudiate violence, however and wherever we can, with all the energy we can muster. 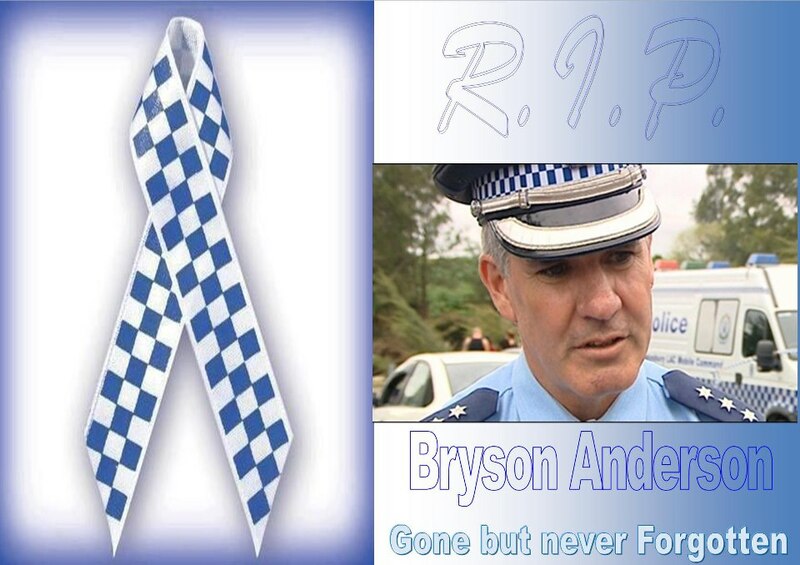 For his wider police family … of which all police officers and their families are a part … Bryson’s death will neither be forgotten nor be in vain. Bryson’s courage and conviction inspire us now … and will into the future. We will continue to protect and serve the community as Bryson did. Of that he can be sure. 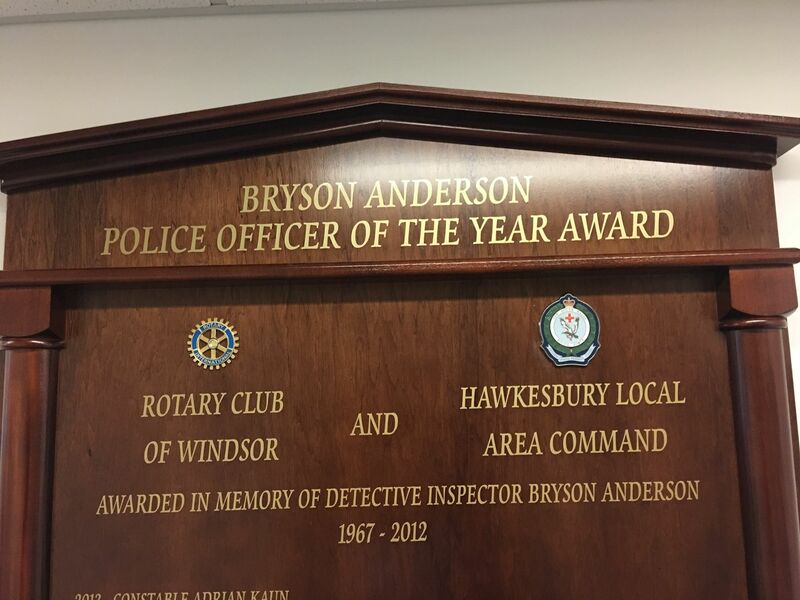 It is my honour today to posthumously confer two awards on Detective Inspector Bryson Anderson. The National Police Service Medal: recognising Bryson’s ethical and diligent service in protecting the community. And the Commissioner’s Valour Award for the conspicuous action and exceptional courage he displayed at the incident in Oakville where he lost his life. After being attacked with a knife and sustaining wounds that would prove fatal, Detective Inspector Anderson went to the aid of a fellow injured officer without hesitation. Conferred for conspicuous merit and exceptional bravery whilst under attack during the execution of his duties at Oakville on Thursday, 6 December 2012. By his conspicuous actions and exceptional courage in a dangerous situation, Detective Inspector Anderson evinced the highest standards of the New South Wales Police Force and is so conferred with the Commissioner’s Valour Award. 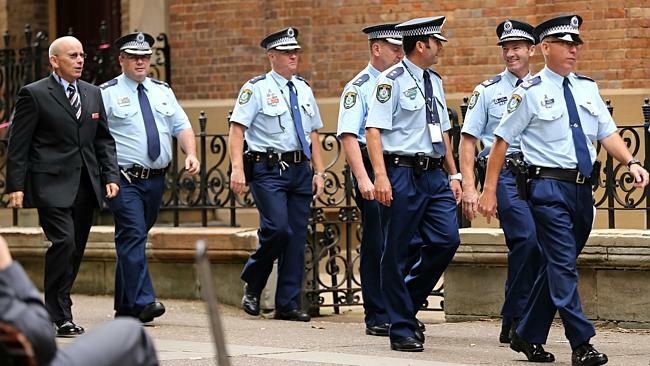 I am deeply honoured, and indeed privileged, to be able to represent every member of the New South Wales Police Force here today to farewell a man who served his community with courage, honour, and distinction. A prized friend and colleague. Our prayers are with you Bryson. May you rest in peace. 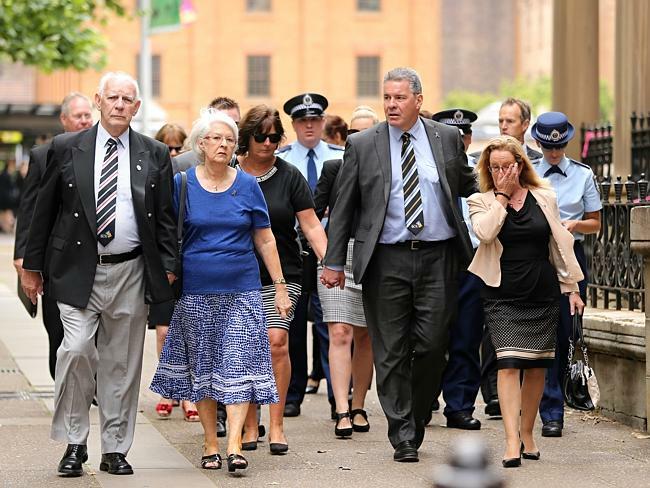 THE mother and son charged with killing decorated police officer Detective Inspector Bryson Anderson have pleaded guilty on the morning their trial was due to start. Detective inspector Bryson Anderson, 45, who was killed when he attended a neighbourhood dispute in Oakville on December 6, 2012. Mitchell Barbieri pleaded guilty to murdering the 45 year old officer, while his mother, 47, pleaded not guilty to murder but guilty of the officer’s manslaughter. The pleas came as the jury were about to be empanelled and begin to hear the opening address. Bryson Anderson was killed on December 6, 2012, after being called to the pair’s Oakville home, in Sydney’s north west. Fiona Barbieri’s plea to manslaughter is being accepted on the grounds of “substantial impairment”, the court heard. It is expected a sentencing hearing will take place next year. Mitchell Barbieri, 21, is facing a mandatory life sentence without parole for murdering a police officer. The Supreme Court was packed with family, colleagues and friends of Det Insp Anderson, some of whom shed tears as the guilty pleas were announced. Flanked by police officers, Det Insp Anderson’s brother Warwick Anderson thanked the investigating officers for their “support and strength” and the hard work of the DPP. He said the family was very mindful of the officers who were with his brother on the day he died and who continued to suffer physical and psychological injuries. “The thoughts, care and prayers of our family go out to them,” he told reporters outside court. Justice Robert Hulme adjourned the case until next Wednesday, when the Crown will begin calling evidence on sentence. Defence counsel will give their submissions to court on November 24.